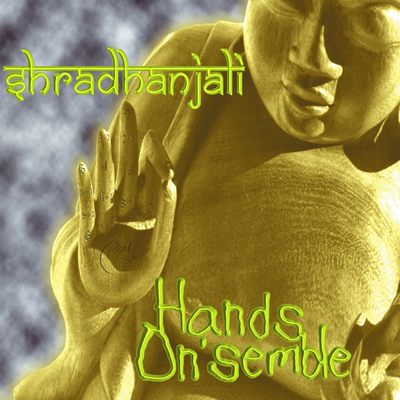 Shradhanjali, second CD from Hands On’Semble features new compositions, a bonus live track, and a guest performance by legendary Frank Zappa percussionist Ed Mann. “The Hands On’Semble is a group of four very talented percussionists- John Bergamo, Andrew Grueschow, Randy Gloss, Austin Wrinkle-who blend percussion oriented musical traditions from around the world to create music with exotic, yet accessible sounds. Working with frame drums, tabla, riqs, doumbeks, and numerous found or created instruments, the ensemble uses vamps, improvisation and enough western musical sensibility to create works from recognizable musical forms that “make sense”to western ears. They seem to be a musical democracy, one in which each member is given ample solo space. The title of this nine-track CD, Shradhanjali, is taken from a sanskrit phrase meaning gratitude for or to one’s teachers. Indian music and jazz – AABA/solos/AABA musical form and emphasis on solos from jazz, Afro-Cuban clave as an underlying rhythmic cycle, and Indian instruments. Its overall sound is more Indian than Salsa, thus the name. “Arumvarumvu” is one of the many names for the bullroarer, a piece of wood tied to a length of string and spun over one’s head. The ensemble created a piece of music, with an actual melody, using only a few of these ancient instruments. “Turtle Talk” is a work inspired by a combination of Balinese gamelanmusic and a West African bell pattern. “No Thumbs” is a free improvisation on the African thumb piano, or kalimba, by John Bergamo in which he uses his fingers and NO thumbs. “X-Mas in Goa” uses pandeiro and tabla with electronic processing, and almost sounds like a techno dance tune, except with live tambourine and tabla tracks. “Improv With Ed”, with guest percussionist Ed Mann, may be one of the only pieces where one can hear a Densmorephone, an instrument built by former Doors drummer John Densmore. It’s a gamelan-inspired contemporary music work. Sounding like a resonant computer working through a complex program, “Easy Schlepp” features boomwhackers (tuned plastic tubes), a berimbau, and cheng-cheng (Balinese cymbal instrument). “Piru Bole” a live track, is an Indian piece with tabla and syllabic singing. the way through. I’ve been listening to it for three days solid. production and the playing were way improved over their first CD. This kind of puzzled me, because I liked the first album. Alas, I have to work..I’ll be there in spirit. stop through Dallas on your way back..